Confused? If so, bundesliga.com is here to put you on the right track with our guide to German football lingo that will have you discussing tactics like a local in no time. It is hardly surprising the term is Italian given their reputation for defensive excellence but it was a role personified by a German: Franz Beckenbauer. Nicknamed 'Der Kaiser', the Emperor, the Bayern Munich great was the polar opposite of the ‘fox in the box’ goal-hanging striker. His kingdom was the area between the centre-backs and his own goalkeeper through which he strode imperiously, nipping danger in the bud before distributing the ball from the back in the style of the best ball-playing centre-backs of the modern day. A position requiring thought and intelligence, there is a good reason Beckenbauer is the only real footballer in Monty Python’s Philosophers’ football match. The role was reprised by Lothar Matthäus at Bayern in the twilight of his career, but is rarely used now with the 'sweeper-keeper' à la mode. There is no English equivalent for this position, which is most often employed in a 4-3-3 formation. While the number 6 (the defensive midfielder, remember? Yes? Well done! No? Keep up! ;) ) is positioned closer to his own team’s defence, the number 8 plays further up the pitch, providing the essential link between front and back and is a key element in transitions, from defending to attacking and back again. The best 8s have a dash of the bite and industry of a bona fide 6 blended with a hint of the creativity of a Zehner (see below) and a slither of the goalscoring ability of the Torjäger (see below). 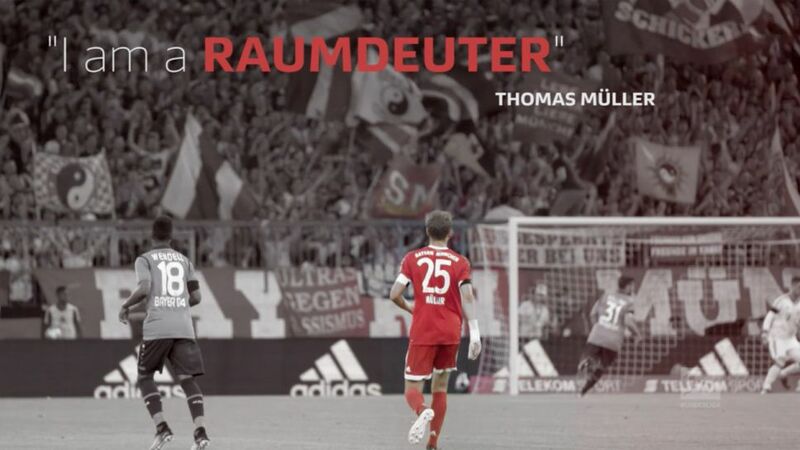 Ever wondered how to categorise Thomas Müller’s best position? He’s not quick, he’s not athletic, he’s not powerful — Arjen Robben once suggested his bony Bayern team-mate never got injured because he doesn’t have any muscles — but isn’t he oh so effective? So what is he? "Ich bin ein Raumdeuter," he once famously replied JFK style, "I am a space interpreter". What does that mean? Just watch Müller in action, and admire his sixth-sense to move into the space where — as if by magic — the ball appears a fraction of a second later. Now often copied, but never bettered. 'Zehn' means 'ten' in German; in football, it corresponds to the shirt number that has — through the ages — been worn by the most creative player in the side. Positioned in the middle of the three behind the lone striker in a 4-2-3-1 formation or at the tip of a diamond-shaped midfield in a 4-4-2 like the peerless Zvejzdan Misimovic was during Wolfsburg’s sensational 2008/09 title-winning season, your average 'Zehner' has the vision and imagination to spot the pass no-one else can see, and the ability to deliver it, usually with laser-guided precision. He is not only the conductor but also the soloist performing the show-stopping number before the Torjäger comes up with the finale. No, not the funniest man in the dressing room, nor a laughable addition to the squad. In fact, if the opposition do not take him seriously, he could be the one having the last laugh. He’s the ace up the sleeve of the coach, the man brought off the substitutes’ bench to save the day when his team needs a hero. If he grabs a goal or even tees up a team-mate for one, he not only pushes his claims for a place in the starting XI, he also makes his boss look like a tactical genius.